WordPress is one of our favorite CMS’s on the market. With it’s ability to customize, user friendlyness, huge plugin market, and SEO friendliness, it makes it a very dynamic and powerful CMS website for your potential Connecticut web design clients. 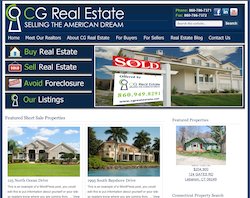 Recently we had to opportunity to build CG Real Estate‘s website. For this project I chose the Agentpress Child Theme and incorporated a new IDX. IDX Broker is the plugin of choice. There is nothing better on the market for that IDX currently that I have found. And while it can be a little pricey per month than what most Agents are used to – you get what you pay for. Automatic MLS synchronization meaning NO MORE MANUAL MLS ENTRIES, saving the agents tons of time. A beautiful backend, tons of CSS customization, WordPress integration, round robin lead generation and lots more. Incorporating the IDX Broker plugin and all of its features took a bit of time, as you need to mold it specifically to your WordPress installation and creating custom DNS links wasn’t too painful either. Thankfully IDX Broker’s support documention was pretty well written and they even have special instructions for those using Agentpress. IDX Broker Phone Support was also very helpful the 3 times I called for some specific tech questions about their software. The Agentpress Theme also has a huge support community making it easy to fix some bugs out of the box without having to search through mounds of code for hours. If you are debating using AgentPress or even contemplating which IDX to incorporate, look no further. IDXBroker and AgentPress are a dream combination. With that said, the client CG Real Estate seems to be very pleased with their new website, and we are pretty happy with how it came out too. If you are seeking a Connecticut Web Designer, check out our portfolio at www.logisticsct.com or give us a call 860-942-8522 for a free website analysis and quote. What do you charge to create this type of website?